Before I get started talking about Bora Jewelry, I just want to say that if you are the kind of person who can resist the temptation to buy things for yourself when doing holiday shopping, then hats off to you. I on the other hand, well… I haven't quite succeeded. It was last week when I was strolling through the Union Square Holiday Market (for those who don't live in the NYC area--this is one seasonal shopping hub worth a visit) and saw the Bora booth. Bora, a Brooklyn-based jewelry company I'd just discovered then, is run by two brothers, one of whom designs the pieces. Mostly the designs are for rings--silver, chunky cocktail rings with gold-toned floral detailing on many and at least one large semi-precious stone ornamenting each of them. In the ring you see pictured here, there's a rough-cut ruby. Though I liked this one, I ended up buying a ring I liked that had an emerald-cut smoky topaz. With the gold metal flower detailing and almost black color, I thought it had a bit of an elegantly goth edge. 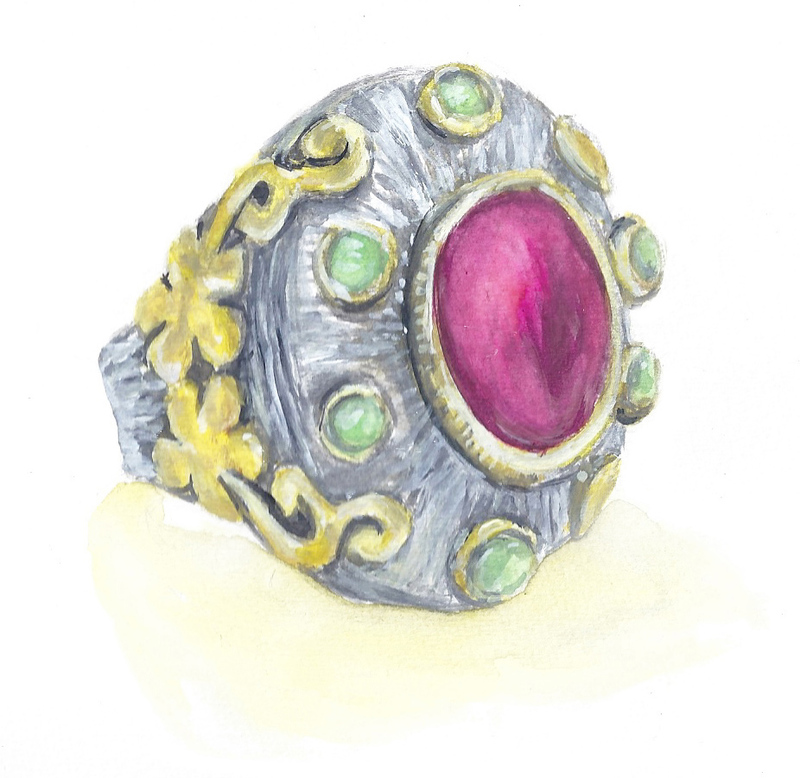 I would have liked to illustrate that one, but I don't have the ring at the moment, since after I picked the design I liked, I realized it didn't fit me. So after making a $25 deposit, I await having a new one made for my freakishly small ring finger. As for prices, Bora pieces average $125-$300. My ring, which had a design a little smaller than some of the others, was $110. Sadly there's no company website, so to find their goods, you either have to head over to their booth at Union Square Market by Christmas Eve or you could also find some of their pieces at Anthropologie, which apparently is a distributor. Another option I found while looking for info about the company online is Amazon, which also has a few of their rings available for sale. UPDATE: Based on comments left here, I want to note that this site is not affiliated with Bora. The email address Bora has provided for customer inquiries is borajewelry@gmail.com. UPDATE 2 (February, 2017): I still occasionally hear from people about Bora. Here's another post I wrote about the company, which apparently can be hard to get a hold of.